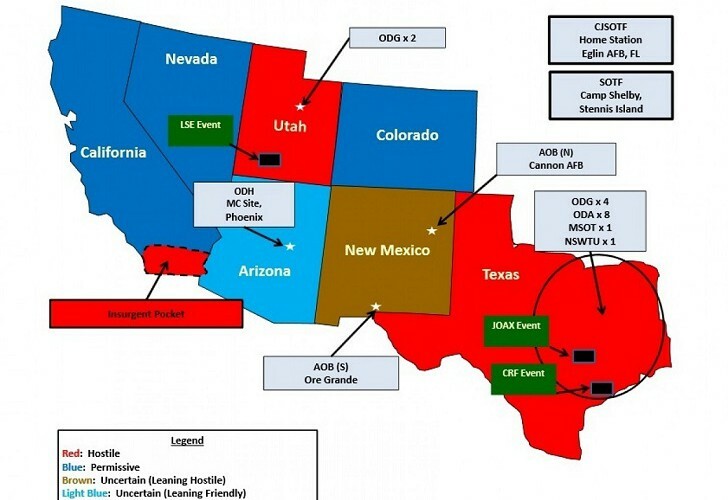 A citizen surveillance group says it plans to monitor Operation Jade Helm, the U.S. military’s planned 7-state training exercises, as it begins throughout the Southwest on Wednesday. Counter Jade Helm, aka CJH, is a training exercise for the people. In response to the military’s multi-state training, called Jade Helm 2015, citizens will participate in an unofficial fashion to practice counter-insurgency, organizational & intelligence gathering & reporting skills. CJH is not affiliated w/the military’s training exercise. The objective is not to stop or countermand the military’s training, but to practice our own skills. Anyone can participate. Groups w/in each state that will play host to the military are being established to streamline the process. Individuals not wishing to be affiliated with a group can also submit information to this website for analysis & publishing. National organizer Marine Pete Lanteri, 44, described by The Hill as a former Marine & “a New Yorker currently living in Arizona,” said that the group’s main goal is to observe what the military participants do in public. Embedded reporters won’t be permitted at any point during the exercise, in which military officials say that secretive Special Operations troops will maneuver through private & publicly owned land in several southern states. Lt. Col. Mark Lastoria, a spokesman for Army Special Operations Command, said his organization is considering allowing a small # of journalists to view selected portions of the exercise later this summer, but nothing is finalized. That means Counter Jade Helm participants like Texas surveillance team leader Eric Johnston, a 51-year-old retired firefighter & sheriff’s deputy, will be the primary source of public information about the military’s actions. Johnston said that 1 of his team members is a licensed pilot who plans to conduct aerial surveillance of the military maneuvers. The citizen response to Jade Helm mirrors Republican Texas Gov. Greg Abbott’s April decision to mobilize his state guard to observe the U.S. military’s planned training exercises in Texas after 100s of residence relayed concerns about Jade Helm. Americans & some lawmakers skeptical of the Jade Helm exercises have at times been ridiculed by the mainstream media & political establishment. But amid intense Jade Helm secrecy & increasing federal power in recent years, people leery of the training event represent a sizable percentage of likely U.S. voters.